Dirt doesn't stand a chance. 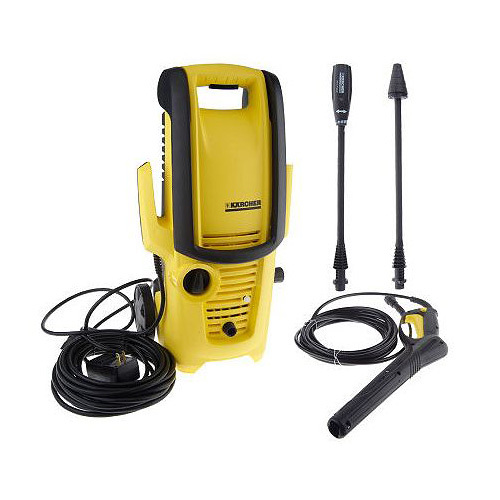 Packing 1600 PSI of cleaning power, this pressure washer eliminates grime from your house, deck, patio, car, driveway, and more. The economical unit uses less water than a standard garden hose--but creates 32X the pressure for effective cleaning! Use the VPS nozzle to change between different pressures, and employ the rotary nozzle when the dirt is extra tough. From Karcher. Weight w/o Accessories 14 lbs. Dimensions (L x W x H) 19" x 12" x 12.5"